Slipknot's Joey Jordison has triumphed in Rhythm magazine's search for the greatest drummer of the last 25 years, to coincide with Rhythm's 25th year as the UK's best-selling drum magazine. The masked drum behemoth took top spot in the MusicRadar.com poll, taking a massive 37 percent chunk of the votes, with more than 38,000 people placing their votes in his favour. 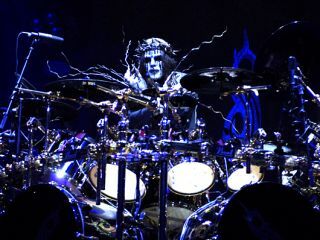 Jordison, who has recently been concentrating on work with Rob Zombie and Murderdolls, burst onto the drumming scene thanks to his virtuoso playing on Slipknot's self-titled debut album back in 1999. Rhythm's editor Chris Barnes said on the win: "I'm not at all surprised about Joey's victory. Since Slipknot hit the headlines in the late '90s we've been consistently blown away by his mind-blowing technicality and ability to bolster any project with his unique sound and style. He obviously has a massive legion of loyal fans. "Let's not forget the other phenomenal players on the list though. Vinnie Colaiuta, Steve Gadd, Jeff Porcaro et al have all contributed so much to drumming in the last quarter century. I personally voted for Stewart Copeland." Dream Theater drummer Mike Portnoy beat Porcupine Tree's Gavin Harrison to second place in the poll, with the pair earning 29,042 and 21,564 votes respectively. Neil Peart and Dave Grohl completed the top five, ahead of Travis Barker, Nicko McBrain, Vinnie Colaiuta, Jeff Porcaro and more. Click here to read the run-down of the 20 greatest drummers of the last 25 years on the Rhythm magazine blog.